Onward is an attractive yellow pear, often with an orange flush, and occasionally some russet. 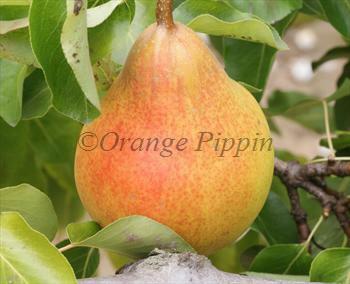 The flavour is of high quality and it is a reliable cropper - all in all, an excellent garden pear variety. Onward was developed from the well-known French variety Doyenne du Comice, usually considered the best-flavoured of all pears, but somewhat fussy in its requirements. The goal was to retain the excellent flavour and texture of Comice but in a tree that was easier to grow in the UK. Please fill in the details below and we will let you know when Onward pear trees are back in stock. Onward is in flowering group 4. Onward is self-sterile and needs to be pollinated by another tree of a different variety nearby. Far easier to grow in almost every respect than Doyenne du Comice, crops are reliable and the blossom is usefully resistant to spring frosts. The main horticultural challenge is that it can be difficult to spot when Onward pears are ripe, so you need to be alert from mid-September onwards in the UK, to make sure you pick the crop at the right time. The pears should be picked when still relatively hard and ripened in a fruit bowl, as they will not ripen correctly on the tree. Note that contrary to what our pollination notes say, Onward will not reliably pollinate Doyenne du Comice or vice versa - they are too closely related. Developed at the National Fruit Trials at Wisley, in Surrey. 1940s. It is a cross of Doyenne du Comice and an old Laxton's variety called Superb.